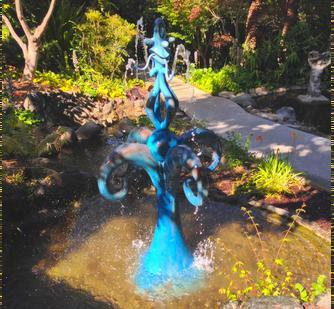 This blue tendril-like water fountain combines cartoon-like features with abstract biomorphic shapes that evoke living forms like plants and bodies. While LA-based artist Kenny Scharf often uses a vocabulary of cartoon personalities drawn from his childhood, the natural world remains his primary inspiration. Having spent many years living in Brazil and travelling in the Amazon Rain Forest, his work is replete with reference to organic growth and natural forms. But the landscapes he crafts are often anthropomorphic; cartoon faces frequently emerge and nature is animated and inhabited by otherworldly creatures.